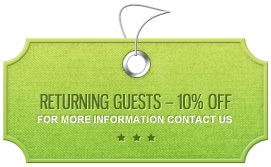 See what other travelers say about Black Tree on Trip Advisor. Visit now! 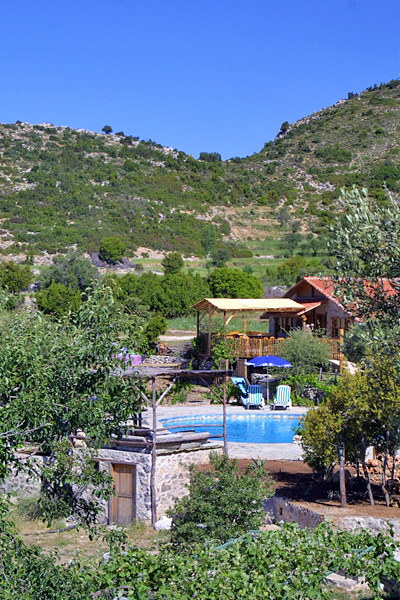 Situated off the beaten track in the lush heart of beautiful farmland and beneath the soaring mountain landscapes of the southwest of Turkey, Black Tree Organic Farm and Cottages is the ideal rural getaway. 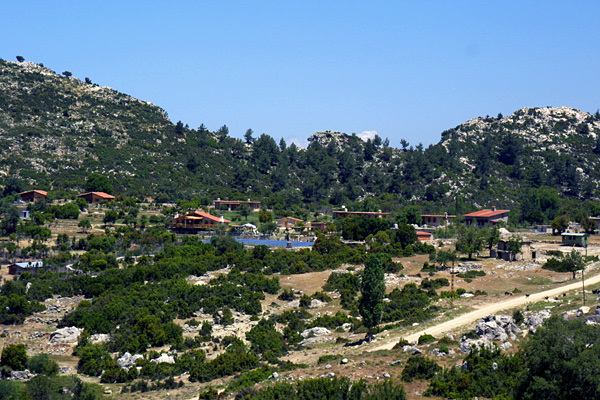 While a retreat for those seeking a holiday in Turkey away from the tourist hotspots and crowds, Black Tree is also a great place for young families looking for an active and creative vacation amidst unspoiled nature. 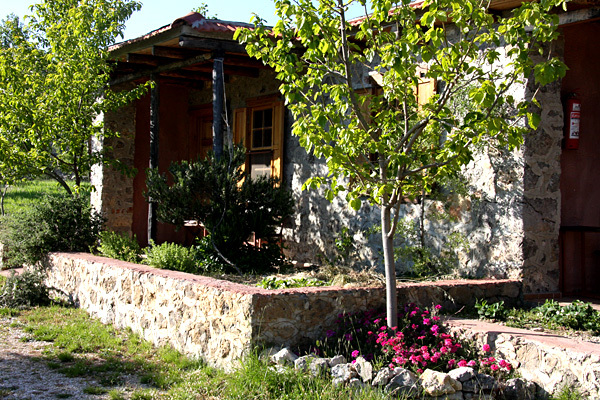 Just 2 km from the famous Lycian Way trekking route, this traditional farmstead also offers a unique alternative to camping overnight and other local lodgings for walkers. 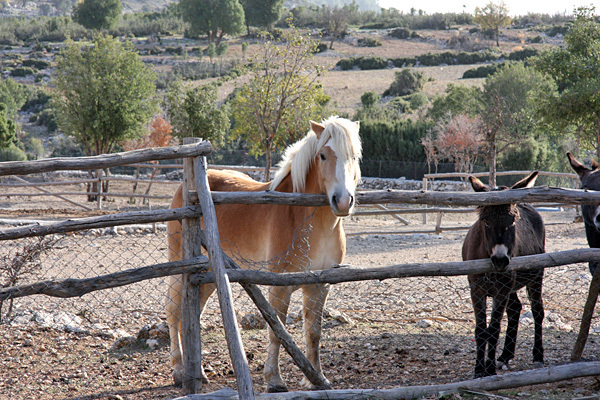 Black Tree aims to be self-sufficient supporting the local village community as well as farming its own organic produce and keeping sheep, goats, chickens and donkeys. While offering the experience of a real farm setting with the choice of the large original farmhouse or one of 9 self contained stone cottages to stay in, guests at Black Tree also enjoy the on site bar-restaurant and other great facilities on the farm including a pool, tennis court, mountain bikes, a pottery wheel, library and a telescope. Whether you come as a group of friends, a couple or a family, Black Tree is a great base from which to explore the local country side and pathways, as well as venturing further afield by car or on longer treks to visit unspoiled beaches and bays, some of the many ancient sites in the region, or go horse riding or mountain biking. Many guests return time and time again to Black Tree, often because of their interest in wildlife, botany, or archaeology. 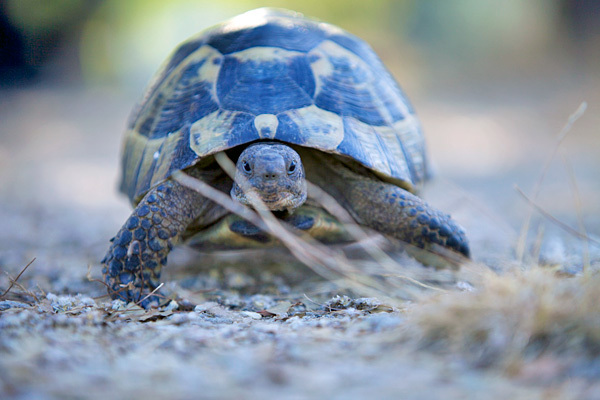 Others come just to relax and do nothing for a week or two in uncompromising peace and quiet, while families return to find the ideal balance of nature, good food, activity when wanted, safety and freedom. The large restaurant and bar at Black Tree sits on a wide terrace overlooking the valley and hills beyond. It’s the perfect spot to sit and relax with a book, spend time with family and friends, or get to know other guests. Food here is served throughout the day. 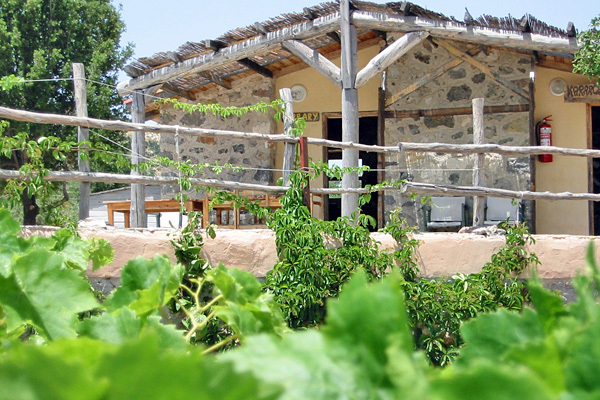 Both English and Turkish village breakfast are served until lunchtime. Our daytime menu consists of a variety of snacks, sandwiches and traditional Turkish food. In the evenings the charcoal grill is lit and we serve lamb-spit and seafood feasts regularly. Much of the food served at Black Tree comes from our own and local village produce, and all produce is obtained from sustainable resources and grown using traditional methods. Black Tree caters for those on special diets. In addition to the restaurant, there is a small food store at Black Tree where you can buy anything from tomatoes and tuna fish to sea salt and soap. 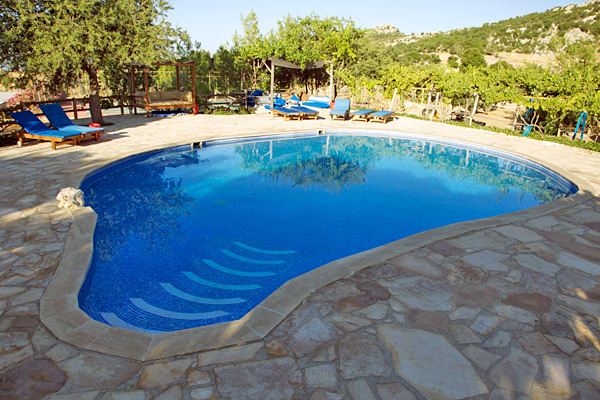 The pool at Black Tree overlooks stunning views, has plenty of shade, and is available for all guests’ use. 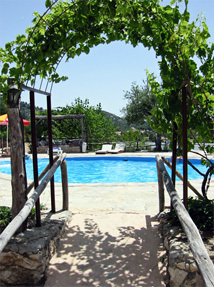 Once a week pool activities are arranged for children. Also for kids, there is a play ground, as well as a cushioned indoor playroom equipped with tv and dvd player so children can have some quiet time while you enjoy relaxing nearby at the bar. On the 20 acres of farmland at Black Tree there is plenty of space for kids to run around and explore. 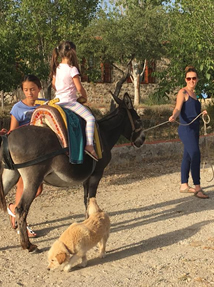 We can arrange donkey and pony riding. Black Tree’s tennis court is free for guests’ use. We have rackets and balls, but experts may like to bring their own equipment. We also have a billiard table and mountain bikes. There are some excellent tracks along the forest routes nearby and the bikes are available to ride any time. New for 2015! 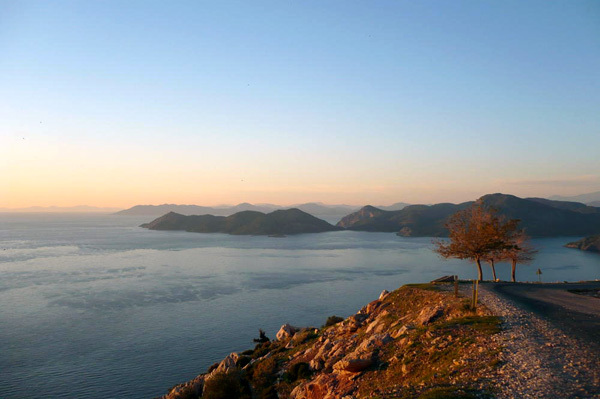 We have installed a fantastic mini solar-heated Turkish Bath on site which will be open once a week for our guests. The health benefits of a detoxing, invigorating and cleansing Turkish hamam bath have been celebrated since the days of Ancient Rome. Begin your holiday at Black tree with the ideal antidote to all those tensions that build up over time, and rid your body and mind of stresses so that you can relax from day one and get the most out your holiday. If you’ve got through all your holiday books, the library at Black Tree has a lot to offer, including a reference section. This is also where you’ll find our telescope available for guests’ use day or night. If you’re inspired to try your creative hand, we also have a pottery studio with a Turkish wheel, terracotta clay and a small kiln. You may choose to hire a car for your stay, but Black Tree does offer transport to the beach once a week. 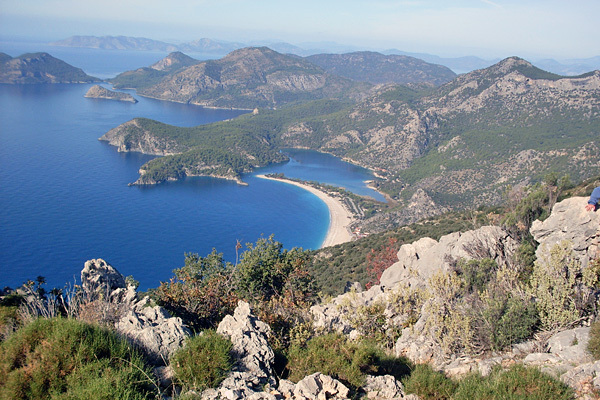 Alternatively, for walks to the most local beaches, Kabak is a 2 hour and Balatli Beach a 3 hour walk from Black Tree.